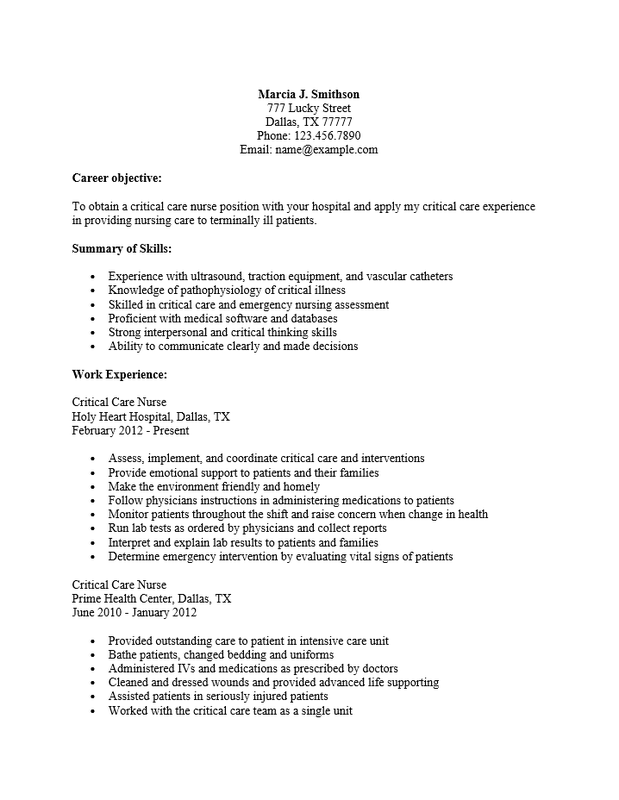 The Critical Care Nurse Resume Template is designed with successful job hunt in mind. This is a very demanding career. Critical care nurses deal specifically with patients who need a high degree of vigilance and care. Many of these patients may be unable to live without an advanced level of nursing and will require maintenance involving such things as intravenous medication. 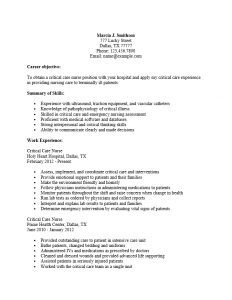 Critical care nurses will be required to be knowledgeable in medical technology, medical procedures, and possess a strong understanding of psychology. It will be essential for a critical care nurse to possess the ability to go from zero to sixty at a moment’s notice due to the nature of intervention management. The goal of this resume template will be to facilitate the organization of a job search in an already demanding field. Administrators and hiring entities will have some very high standards when seeking CCN’s and thus candidates will have to rise to the occasion via a sharply written resume with definitely worded content. This is not a resume where being vague with fluffy language will be appreciated. Job seekers must be very specific about their goals, credentials, experience, and skill sets in order to be taken seriously. While a template does not concern itself with content (this is up to the user), it will make it easier to compose a good resume by acting as a general guide while removing the stress of meticulously formatting a resume. This can be quite helpful when one is under the pressure of aiming a resume to a specific potential employer. Step 1. Enter your name and contact information at the top of the page. Step 2. Under “Career Objective,” write a brief synopsis stating your professional goals. Step 4. In “Work Experience,” write a list of places you worked stating your job title, employer name and location, dates employed and duties performed. Put this in descending chronological order. Step 5. The “Education” section is reserved for your academic credentials. Here, place the title of the degree you earned, the school you earned it in, and the city/state of this institution. It’s wise to include the date but necessarily mandatory. Step 6. In the “Certification” section, list the certificate/license you hold. Step 7. If you have references, state this in the ‘References” section. This should be no more than one statement unless you have attained permissions to give specific contact information on your resume.